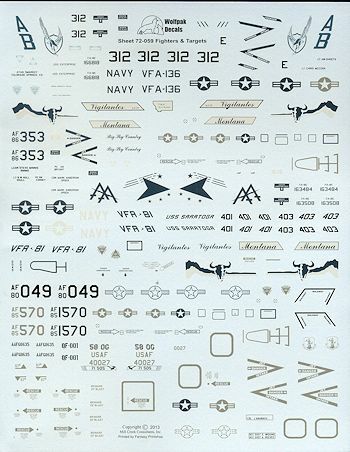 This next Wolfpak decal sheet has more modern and thus more grey planes. There are six subjects with one having two markings options. First up is the initial QF-16. Apparently the USAF has nearly 300 of them in the boneyard, as much thanks to the drawdown in ANG units as much as anything else. This one is the first plane and the rest will be d one by Boeing so I guess that the folks at Mojave will be out of business after the last F-4 is done next year. Standard F-16 two color scheme with International Orange fin, wing tips, stabilators and ventral strakes. This one last served with the NY ANG. Next is an F-18E with VFA-136 aboard the USS Enterprise for their last cruise in late 2012. Three mission marks on the nose. An F-15C from the 186 FS, Montana ANG is next. This is from mid 2010 and is in the Mod Eagle paint scheme. 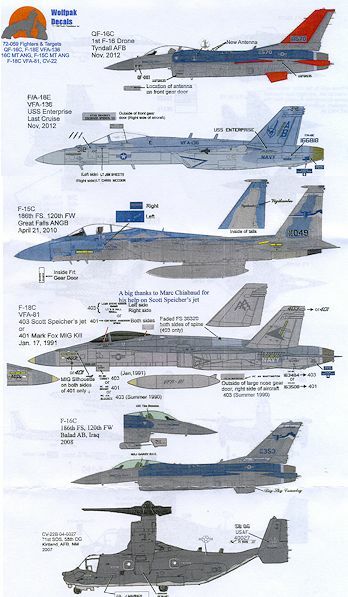 An F-18C from VFA-81 is next. This is from Desert Storm in January 1991. You can do the MiG killer plane or another standard jet as flow by Scott Speicher who was shot down and killed by a MiG-25 on the opening day of the conflict. Finally, a USAF CV-22B Osprey from the 71st SOS at Kirtland AFB in New Mexico.